Let’s just start with… I am the mom of the Teenage Muntant Ninja Turtles. 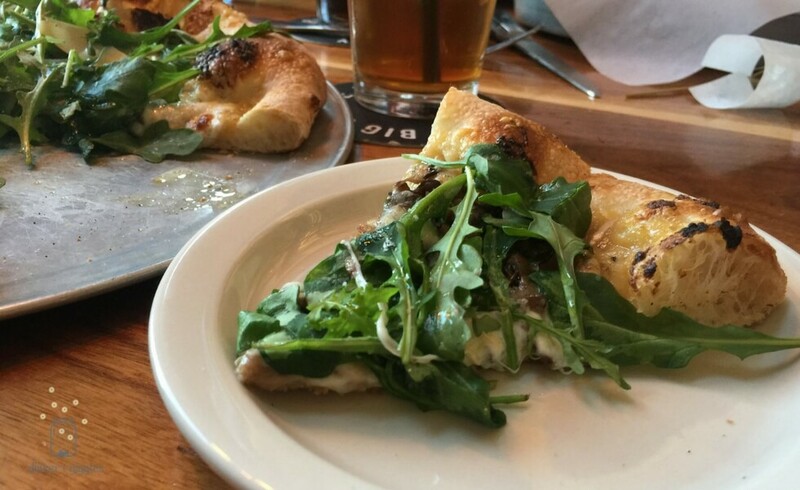 Since moving to Iowa a little over two months ago, we’ve tried a number of “pizza” joints. I think it’s an American thing that when you move to a new town you seek out that familiar place. 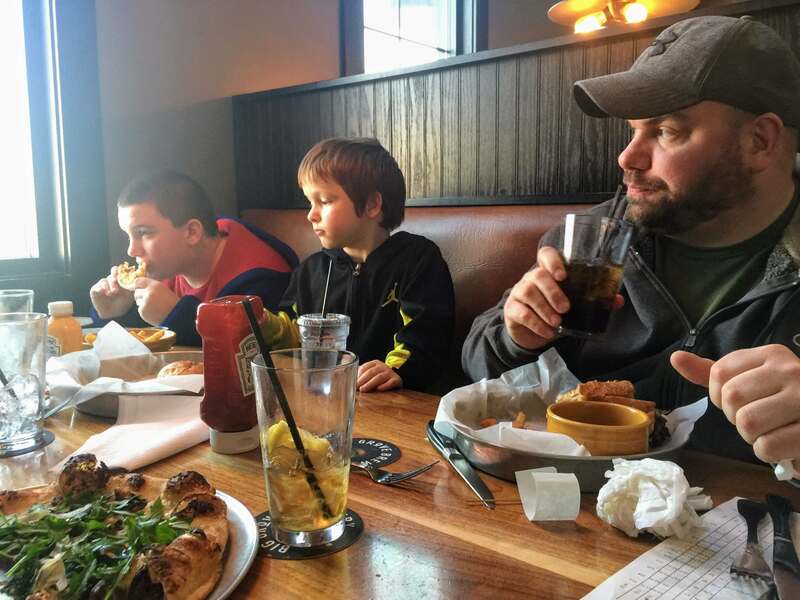 For us, having 4 boys that would live on pizza if they were allowed, that familiar food is pizza. We’ve tried a number of highly recommended (we’re talking Google and Facebook 4.5+ star rated) places. Each one worst than the last. No flavor. Crust that is like paper towel. Prices that are outrageous. It was one big fat #fail after another. I could chalk it up to the fact that I’m pregnant and nothing tastes right these days…but when two entire pizzas are left on the counter and the vultures say “it’s gross”. Then you know it’s bad. My husband and I had declared that Iowa…or at least Cedar Rapids does not know how to make a decent pizza and they are seriously lacking taste buds. That is until we went on a road trip to hit up some thrift stores and found ourselves in Solon, Iowa. But for honesty sake, the real reason for the entire trip was not to seek out pizza or even a nightstand for the boys at a thrift store…but to purposely be near Ely, Iowa to check out Dan & Debbie’s Creamery. I did mention I’m pregnant, right? So, I must fill the cliché of ice cream and pickles, although you can hold the pickle…unless we are talking a Chick-fil-a Chicken Sandwich then bring it on! We arrived in this cute little town. The type you’d miss if you blinked too long. Just a few buildings lining the street. And thank goodness it was diagonal parking vs parallel. We may have had to keep driving if it was. When we walked in we were instantly impressed with the decor. It was a perfect blend of old, modern and rustic. I should mention that the smells hit us before we even opened the door. You could smell “real” food in the air. You know that smell. That one that you can’t pinpoint if it’s wood fire or seasoned meat … but it’s just something that excites your taste buds and gets the drool machine going. Even though we were there well after the typical lunch rush it was busy. Thankfully there was a booth just the right size for our family. Now began the real fun. Figuring out which item to get. 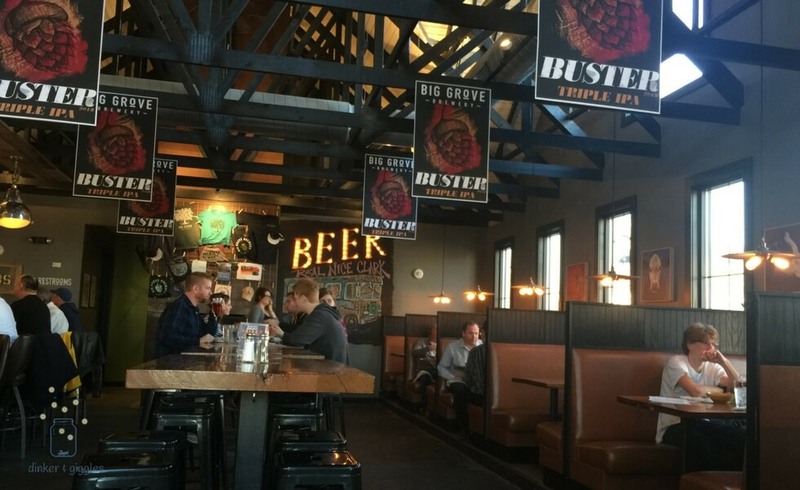 Their menu is simple with a large section dedicated to sharing what local farms the food comes from and who is cooking and working at the establishment. I love that extra personal touch and that there weren’t too many choices. I ended up ordering a mushroom pizza and my one son ordered the sausage pizza. Around the table were a few burgers, a vegan meatball sub, and a prime rib french dip. The only choice I was worried about was the vegan meatball sub that my burger-loving son ordered, but he does love mushrooms. Our waitress was super kind and kept our drinks full. We never once had to ask for a drink. You’d get to your last few sips and suddenly a full glass appeared. We did have an issue with three of our children’s pop. They must have had the last of it as it tasted mostly like carbonation. When we dine out it’s our kids only time of getting a special treat like soda pop. We alerted the waitress and she immediately took care of it and brought fresh drinks. Their machine needed to be refilled with that particular flavor. Easy, quick fix. Our food arrived shortly thereafter. The smells were amazing. I tried my husband’s French Dip sandwich and it was delicious. Perfectly fluffy and fresh bread with just the right amount of toasting. Topped with tender, juicy pieces of prime rib. 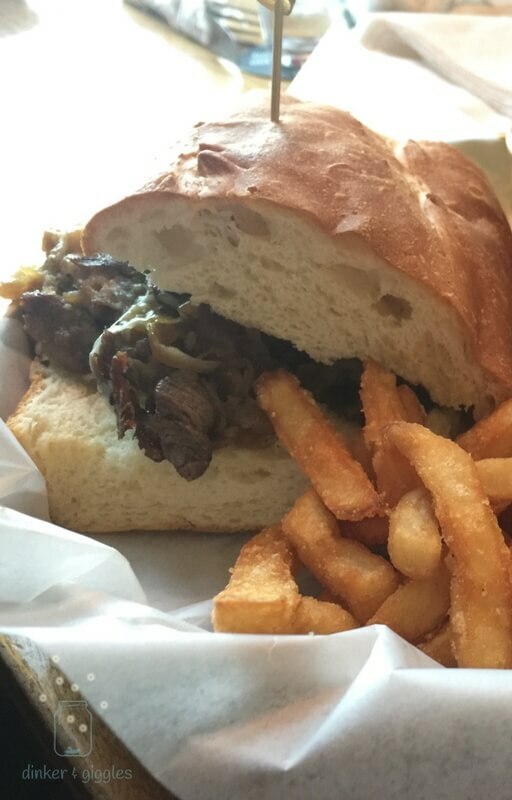 And the au jus dip…not too salty and exploding with flavor. Part of the family enjoying small town views from our booth at the Big Grove Brewery. My mushroom pizza arrived and I almost forgot to take a picture of it before diving it. The crust. Oh, the crust! My mouth is literally watering right now just thinking back to that crust. The ideal combination of crunch and airy dough. Seasoned. I’ve never had a pizza crust that was seasoned like this. I’d order just the crust with no toppings! I think it was a butter garlic. But it was IN the crust, not just brushed on top. Of course, my burger-loving teenager would order a vegan meatball sub. Now, if you were thinking this is vegan, it’s not going to taste like a normal meatball sub, it would have been pretty good. The “meat” balls were made of mushrooms. I know it was vegan, but I think it would have tasted better if it had regular cheese on it versus the vegan-friendly one. The sub went to waste as no one at our table wanted it, but I’m proud of my son for stepping outside of his comfort zone and trying something different. And yes, we were at a brewery. But with the time of day and given that I’m pregnant no one tried their home-brewed selection. From the description on the menu, it looked like they had a great variety. We saw a lot of people drinking with their meal and there were some that came in and ordered pints to go. So our assumption is they are on the up and up when it comes to beers. However, you’ll have to try for yourself. Since our first visit, my one son and I have returned again. This time I got the margarita pizza and he the kids BGB burger again. It was then I remembered how great their fries and homemade ranch dressing are. Also at this visit, he told the waitress that it was his birthday… the big 1-0! They brought out a glass of fresh, local milk and chocolate cookies that were more chocolate chip than cookie. The pizza was as good as I remembered it and our bank account would be in serious trouble if we lived closer to Solon! 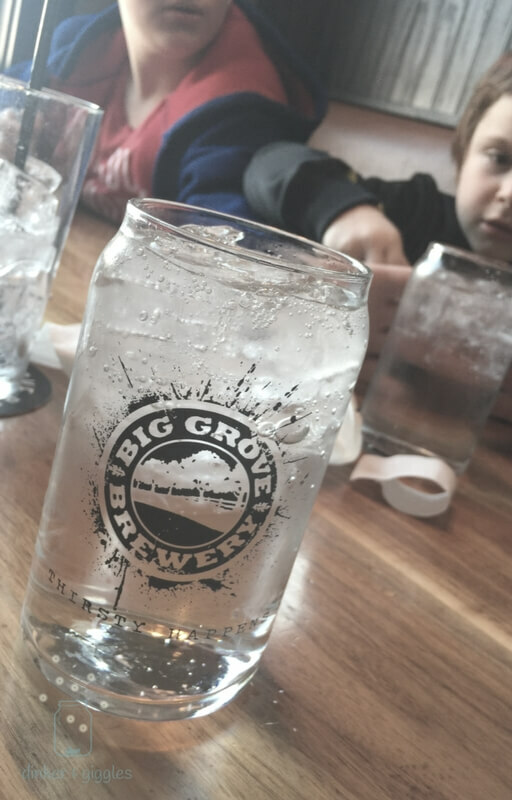 While Big Grove Brewery’s pizza is not a solution for when our large family wants to order a pizza, it is a great place for a special meal. Perfect for mom and son dates, too! Overall, I love the farm to table aspect of the restaurant. Everything is fresh and locally sourced. They even source right from Dan & Debbie’s Creamery! Fresh dairy, meat, produce and grains from all over the Eastern Iowa region. 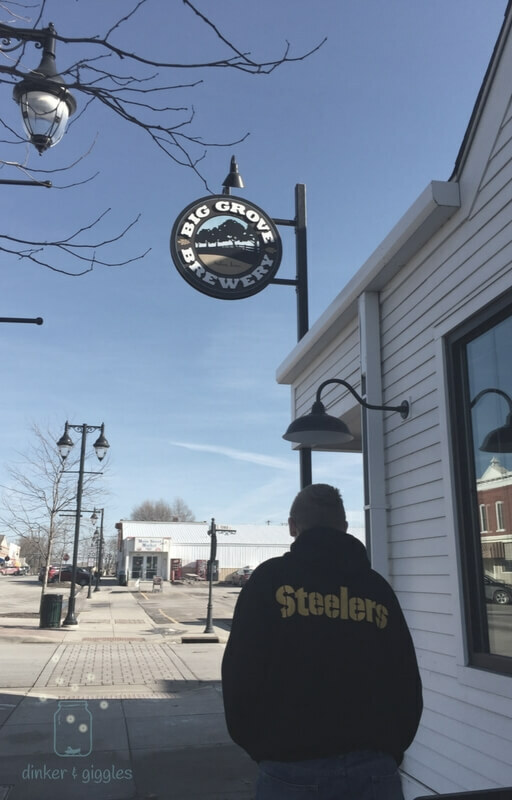 You just can’t go wrong with Big Grove Brewery! Thanks for sharing your journey with your mutant ninjas! The food here looks so delicious! Perfect with some family tricks.